CLICK HERE TO USE YOUR OWN QUOTE! We are happy to make any necessary adjustments to the artwork for you. Simply leave a comment on the cart page. Your customized artwork is printed at 300 dpi with gallery quality archival inks that are fade resistant. Our high quality inks ensure vibrant colors, deep blacks, and bright whites. The semi-gloss 100lb cover paper is specially selected to make the artwork look its very best. These high quality canvases come beautifully wrapped on 0.75" wood frames, and are printed using the latest technology on high end materials. We use gallery quality inks that produce rich, vibrant colors to bring out the best in your artwork. No assembly is required, all of the work is professionally done, and your art arrives ready to hang. Our contemporary, smooth black frames are the perfect way to display your artwork. Our 1" wide wooden frames include a glass front, along with a full set of hanging hardware. Your print will be professionally set into the frame and will arrive ready to hang. Our frames are manufactured in the USA and are of exceptional quality. We ship to the USA & worldwide. All orders are processed in 2-5 business days and shipped from the USA. Expedited processing and shipping are available. 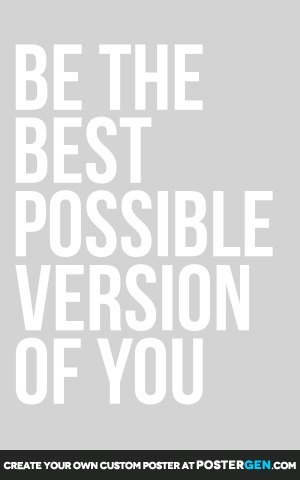 This "Be The Best" print works great for framing or hanging as wall art. Our high quality inks ensure vibrant colors, deep blacks, and bright whites. It will look great as a high quality poster print or wrapped canvas. "Be the best possible version of you"